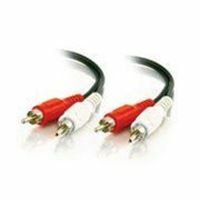 RCA cables that deliver all the detail you expect from your audio equipment. The dual conductor is spiral-wrapped with tinned copper, which provides shielding against EMI and RFI interference. Individually double-shielded 75 Ohm coax with foil and braid shield reduces unwanted noise and distortion. The connectors are color-coded for easy installation and identification and are fully molded to provide excellent strain relief to keep your cable intact. Nickel terminals ensure long-lasting, corrosion-free connections while the PVC jacket provides added flexibility and durability.